GIBSONTON — Millions of dollars and many years in the making, a museum unlike any other is preparing to open here. Its exhibits range from human figures no larger than a fingertip to machinery towering more than 30 feet. Its colorful wall hangings constitute a walk through the history of a livelihood that also is a lifestyle. Its three-dimensional displays can tickle the funny bone and tease mature memories back to the days of carefree youth. Unique though it is, this museum does, however, share certain commonalities with other such facilities; it is an invaluable record, a prized celebration, an honorable tribute to the world of the carnival and to its people, the independent showmen, the “carnies” who bring amusements to the country every summer. Carnivals in America, those cotton candy, sugared pastry, game barker, blinking lights, thrill ride extravaganzas that can make kids out of sixty somethings, date back to the 19th century. The 1893 Chicago World’s Fair is credited with spawning the traveling carnival when it assembled a section of rides, games, burlesque and side show curiosities – the first midway — and, incidentally, presented the first Ferris wheel built by George Washington Gale Ferris. Before the Chicago Exposition, circuses and vaudeville shows toured America’s cities and rural areas, offering sought-after entertainments in an era when homemade music and visitors’ conversations were the primary recreation. After that world’s fair, operators of its midway features took a tip and took to the road. And America embraced the newcomers. By 1902, there reportedly were 17 traveling carnivals and by 1905 the number more than doubled to 46 such outfits. In 1937 – at the height of the Great Depression – some 300 carnivals complete with animal acts, multiple games, flavorful foods, side shows and rides to amuse all ages were crisscrossing the country. From there, the world of the creative traveling amusement purveyors grew into an industry, making millionaires of enterprising equipment manufacturers, making good livings for show owners and their families, making succeeding generations of showmen as sons followed fathers on the circuit of county fairs and church bazaars, civic celebrations and volunteer fire department fund raisers. They began finding their way to Gibsonton in the 1920s, eventually making it the preferred winter home for showmen where family ties and friendships could be renewed, animals rested, equipment repaired, and life slowed to a normal pace in reliably comfortable weather. At this point, five generations of carny showmen in the same family have made Gibtown their headquarters, says Lee Stevens, as he shows a visitor around the new International Independent Showmen’s Museum on the Gibsonton end of Riverview Drive. Stevens, a New York native who notes he left home to join the circus in his teens, is a past president of the 4700-member Showmen’s Association headquartered in an expansive complex on the south side of Riverview Drive, opposite the museum. As a member of the association board which oversees its several components — among them a showmen’s retirement village, multiple charities, a scholarship program as well as the museum – Stevens estimates the local showmen’s colony numbers at least 15,000. As a lifelong carnival feature operator and now a food concessionaire who soon will hit the road with his wife and the youngest of their four children to work venues in and around Chicago for the summer, he knows his industry from the inside out. It has great appeal, he points out, for the independent business individual. “There may be competition for bookings, but if you’re broken down on the road, there’ll also be help.” And their museum, he indicates, stands as testimony. 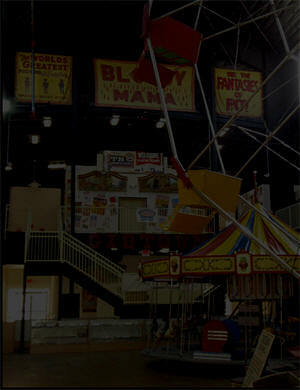 The 40,000 square foot structure started about 14 years ago and finished with a $1.15 million donation from Jim Frederiksen, a manufacturer of carnival machinery, houses on two floors a wide assortment of antique equipment, historic printed materials and detailed exhibits that tell the carnival story – most of it donated by practicing carnies. There’s the bright red 1918 Packard delivery truck that once rolled along small town streets, loaded with tents and gear headed to set-up, and the 1929 Ford pick-up once loaded with pretty carnival women calling attention to the coming event and a horseless carriage like the one Buffalo Bill used to promote his shows. There’s wall after wall of show banners which, like labeled cigar boxes and fruit crates, demonstrates the large number and colorful naming creativity of amusement operators. There are ride cars that go back many decades and a delightful hard-carved goat which once graced a merry-go-round and the fun house mirror that warped the image of everyone who stepped in front of it. There’s the fully-assembled Ferris wheel resting on the ground floor but reaching toward the peaked ceiling above the second. There’s the 60-foot-long midway in miniature, displaying in minute carved detail every conceivable ride and food station and side show, lovingly hand made during off seasons by a Michigan carnival operator. Unlike the conventional circus, Stevens emphasizes, the carnival offers interactive entertainment. Tucked away on the second floor, reached either by a grand staircase or a new elevator, is a library inviting attention to dozens of books related to the industry and outside are several of the large carnival trailers which, with their brightly lettered signage, could excite an entire community when they arrived, forecasting the wonders of the carnival soon to welcome one and all. As many features as the museum has, though, it’s not finished yet. Stevens foresees a repair workshop on the second floor as well as more displays. But what’s needed most at the moment is a curator, he adds. Someone who can become familiar with the industry and the pieces on display; someone able to maintain regular museum open hours, to relate to the public, give tours, provide a comprehensive understanding of the industry for both school youngsters and seniors, he notes. “And if they have grant writing experience, it would be good.” Stevens can be reached through the association office 813-677-3590. Meanwhile, he’s anticipating some help from the University of South Florida in cataloguing a collection of written materials, some of it detailing first hand showmen experiences, and looking ahead to future exhibits. The industry is changing rapidly, he says, incorporating new technology such as LED lights and computerized equipment. 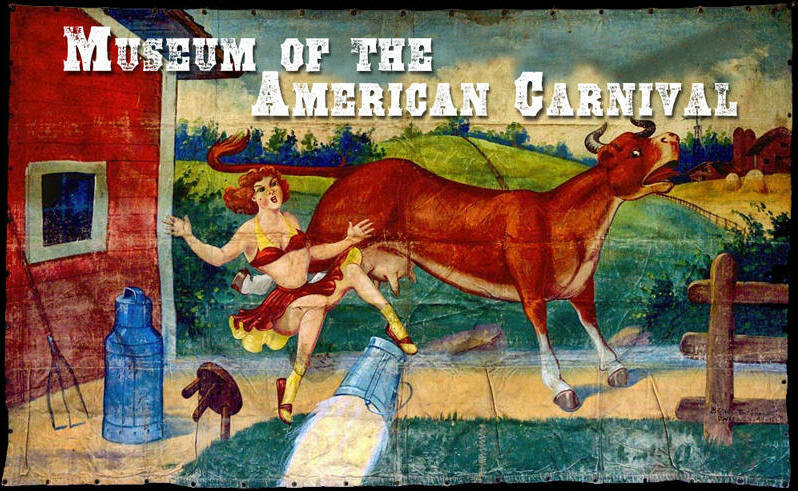 Someday, that, too, will be part of the carnival industry history, another display for the country’s only showmen’s museum.